Canisius College invites interested and qualified persons to apply for the position of part time Assistant Coach for Men's Soccer. 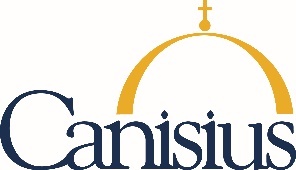 Canisius is a member of the Division I Metro Atlantic Athletic Conference. The Assistant Coach reports to the Head Coach for Men’s Soccer. • Instruct and evaluate well-prepared student-athletes. • Organize and execute individual skill instruction for players. • Schedule and coordinate conditioning drills and workouts in conjunction with assigned strength training coach. • Assist with academic advisement, monitoring and development of student-athletes. • Recruit qualified student athletes for Canisius College Men’s soccer program. • Develop scouting reports for opponents as assigned and evaluate game tape. • Assist with team travel and recruiting trip arrangements. • Assist with coordinating official and unofficial visits, written correspondence and telephone communications. • Market and direct the Canisius College Men’s soccer camps. • Ensure the Men’s soccer program is administered with constant commitment to compliance with all institutional, conference and NCAA rules and regulations. • Playing and/or coaching experience at the Division I level is preferred. • Knowledge of NCAA rules and regulations is preferred. • Experience in training goalkeepers a plus. • Previous experience supervising, communicating with, and instructing student-athletes is preferred. • Ability to work with a diverse population of student-athletes, parents, coaches, and administrators. • Must have and maintain a valid driver’s license with a positive driving record per the college’s insurance provider (or upon moving to NYS obtain a NYS driver’s license within NYS DMV residency guidelines after hire).